How came they to this emptiness? How came they to this dream? Or families or fires to tend? I'm coming back for more! I'm floating back to you! 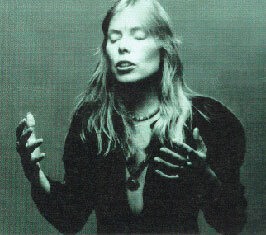 In a RS interview with Cameron Crowe in July 1979, Joni recalled the genesis of "Paprika Plains." "The next time we had a brief conversation was when Paul McCartney had a party on the Queen Mary, and everybody left the table and Bobby and I were sitting there. After a long silence he said, "If you were gonna paint this room, what would you paint?" I said, "Well, think. I'd paint the mirrored ball spinning, I'd paint the women in the washroom, the band..." Later all the stuff came back to me as part of a dream that became the song "Paprika Plains." I said "What would you paint?" He said, "I'd paint this coffee cup." Later he wrote "One More Cup of Coffee." haunting reminisence, songs from the glory box , diamond needle crackle the bumpy vinyl 1977 classic that might perhaps have gone unnoticed but not for me!